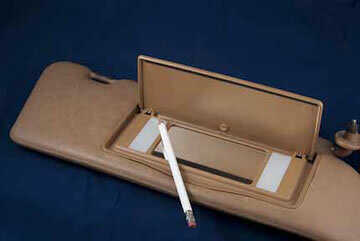 Some visor flaps utilize a pressed fit pin to effect the hinge joint on the mirror cover. The original pins do not have any end features to trap them in place when the press fit loosens. The pins loosen and fall out over time causing the mirror cover to dislodge and become a nuisance. A set of new brass visor pins. Our replacement pins have a rounded head on one side and a hollow end on the other. 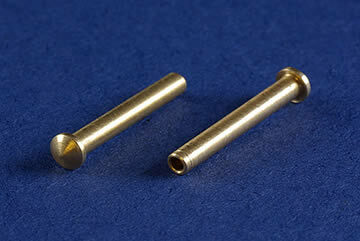 They are made from brass so that the hollow end can be crushed with ordinary pliers after installation. 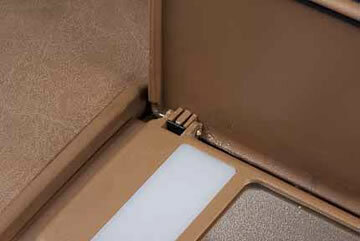 The deformed end traps the pin permanently in place regardless of the wear of the slip fit area of the hinges.